Leave behind the Renaissance treasures of Florence for the day to discover the rugged beauty of the Ligurian coastline. Travel by coach through the rolling vineyards of the Tuscan countryside, and cruise along stunning sea cliffs to the coastal village of Portovenere. Continue on by boat to the famously picturesque fishing villages of Cinque Terre, where you’ll enjoy free time to explore the colorful towns of Monterosso, Vernazza and Manarola. Take an optional hike among terraced hillsides and olive groves, and soak up the views with a scenic train ride along the rocky shore to cap off this full-day adventure. Was so glad to get to see this region of Italy. Was so surprised that even though not a part of the Cinque Terre, that I loved Porto Venere. Well worth the stop. The boat ride to the inquest Terre afforded some amazing views of the coast. Also enjoyed the actual stops in Manarola, Vernazza, and my favorite, Rio Maggiore. Just like pictures you have seen of the area. Our City Wonders guide, Simona, was fantastic!! Fantastic tour! Very comfortable bus ride including a pit stop and quick ferry rides to get to the sites. The time we were able to see each stop was pretty good, though it would have been nice to have a bit less at the longest stop so we could have seen more elsewhere. We only made it to 2 of the towns due to late trains, but they did refund us a little money, which as appreciated. Alessandro was the best guide: very friendly and knowledgable. Definitely recommend this trip if you're in Florence. The day goes by fast. Simona was a great tour guide. It was very crowded this time of year and the crowds limited our time at each island because the line for the train was so long but overall it is a great place to visit. Very beautiful islands. Simona was very accommodating and knowledgeable tour guide. We enjoyed our tour of Cinque Terre and Portovenere from Florence in One Day. It is a long day, but the scenic drive and water trip was great. Our guide was informative and provided many detail of the countryside we would have otherwise missed. Tour was nice but seemed to be hurrying from one place to other iwith very limited time to enjoy any. Tour was great. Our guide Simona was amazing. Would definitely recommend. This was a highlight of our trip. Beautiful part of the country that you must see. Bus up from Florence with 2 boat trips and train ride. Saw all 5 villages with time to explore, eat, relax and shop. There is nothing like Cinque Terre. Excellent excursion with simona. She was A plus. GO!! WOW!! 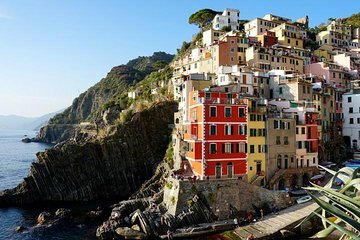 This tour is perfectly planned and very well executed in terms of coordinating a complex set of transportation modes through the destinations of the Cinque Terre. I was unsure of how physically taxing the day might be however I was pleasantly surprised that access to the bus, boats, and trains was easy and doable for older individuals. The overview of the 5 villages and stops along with way allowed for exploration and shopping in just the right of time attributed. It IS a long day, as we didn't arrive back until about 9 p.m. but very well worth the time. Our guide, Maeteo was the BEST. A long day, but worth every minute. Traveled by bus, ferry, and train. All the villages of the Cinque Terre from the ferry were beautiful to see. Train stops on the way back let us visit, even briefly, all the villages. Simone was the perfect guide for the entire day.